Taormina is a city situated on the east coast of Sicily, in the South of Italy. Depending on the period of the year, the weather in Taormina can vary drastically. So you can either choose between beach activities and shore excursions, or tours of the Island. 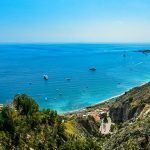 In this article, we will suggest you 10 things to do in Taormina, so you can already prepare your bucket list when visiting the city and the surroundings. 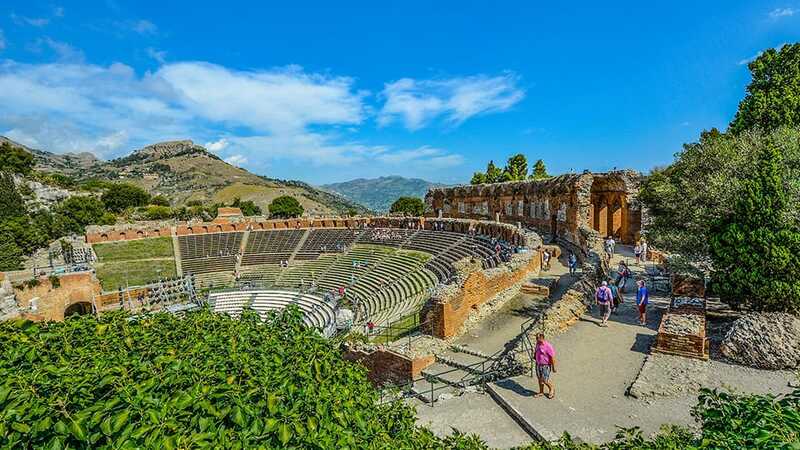 A visit to the ancient theatre is certainly one of the 10 things to do in Taormina. The ancient theatre of Taormina is one of the most beautiful of its kind in Italy. After the Greek Theatre of Siracusa, is the second biggest theatre in Sicily. Even if it’s really old, it is well preserved and still used today for opera and musical performances. If you would like to visit the theatre, you can book our Classic Taormina and Castelmola tour. During this tour, you will also visit Castelmola, a sleepy town not far from Taormina. 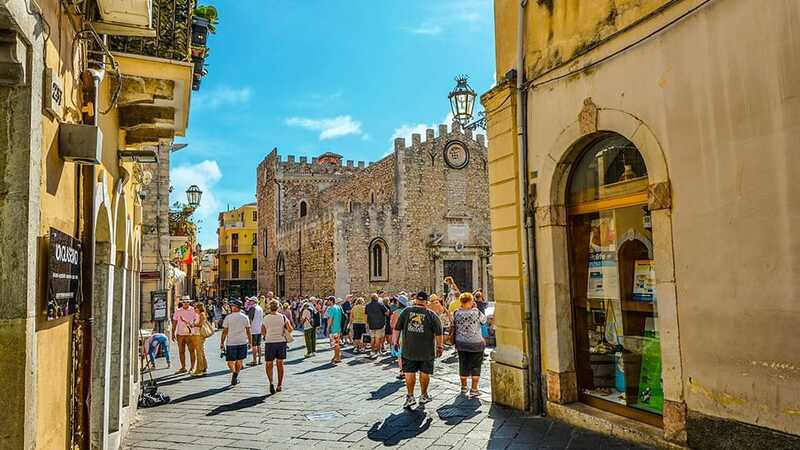 Among the 10 things to do in Taormina, you cannot miss a walk through the famous Corso Umberto. If you are a shopping addicted or you just want to bring something special to your loved ones at home, you will find what you are looking for. In fact, here you can find luxury boutiques, clothes, jewellery, and souvenirs shops. And, if you need your time to make your shopping, we suggest you booking our Private Shuttle Service. With this VIP service, our expert drivers will wait for you and then drive you to your favourite location when you finish your shopping! A visit to Palazzo Corvaja is another of the 10 things to do in Taormina. In fact, the palace is one of the most elegant buildings in Taormina. This ancient palace has characteristics Catalan-Gothic windows and portal. Also, it has a Norman parliament room. Today, it hosts the Taormina’s Tourist Office and particular temporary exhibitions. If you book our Shore Excursion of Taormina, you will also have the opportunity to taste the famous Sicilian granita and ice cream. Indeed, this is one of the things to do and taste when visiting Sicily. Giardini Naxos is famous for its two beaches: the Recanati Beach and the Lungomare. The beach at Lungomare is bigger and there is a nice view of Taormina and Etna. Moreover, Lungomare beach is perfect for families since there are showers, restaurants and cafes. On the other hand, the Recanati beach is smaller, however, it is usually less crowded. 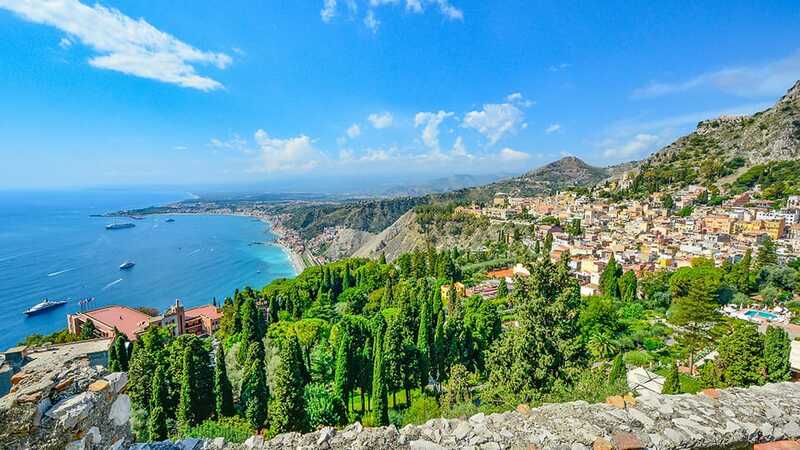 If you would like to book a visit to Giardini Naxos, you can choose our Panoramic Taormina Tour. Madonna Della Rocca is a 15th Century church, that has been carved out of a mountain. Moreover, it is located below the Saracens Castle. During our Classic Taormina and Castelmola Tour, you will also enjoy an extraordinary view of Taormina and the Greek Theatre. First of all, in Taormina, a walk around is a must. During your holidays, the most important place to visit the Countryside is its medieval alleyways and picturesque piazza. Moreover, you will enjoy amazing views of the whole coastline. During our Panoramic Taormina Tour, you will be able to visit this part of the island. Among the best 10 things to do in Taormina, we cannot forget a visit to botanical gardens. Those are finely cultivated gardens, squeezed between red clay tennis courts and fantastic views. 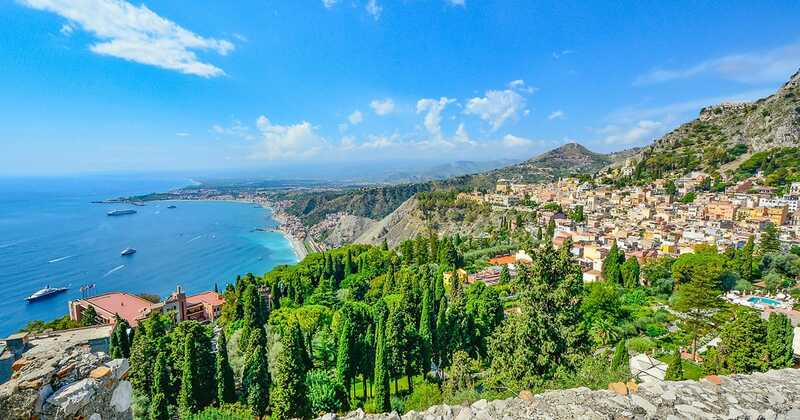 Enjoy the visit of this natural part of the city with our Panoramic Taormina Tour. Also known as The Pearl of the Ionian Sea, Isola Bella is a nature reserve, administrated by the Italian Government. 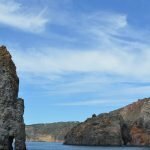 Since there is just a narrow path that often connects the island to the mainland beach, it is really impressive when visiting. Also, the island has a small and rather rocky beach. If you book our Classic Taormina Tour you will be able to visit this breathtaking destination and take some unforgettable pictures. Situated 20 km from Taormina, the Alcantara Gorges are one of the must-see destinations of Sicily. Unique in their kind, the Alcantara Gorges are canyons made of black lava. Moreover, the walls can reach up to 50 meters high, in the shape of a prism taken during the cooling process. Visit the Gorges during our Tour at the Discover of Etna, Alcantara Gorges and Taormina. Next to Taormina’s main street, Corso Umberto, there is Piazza IX Aprile. 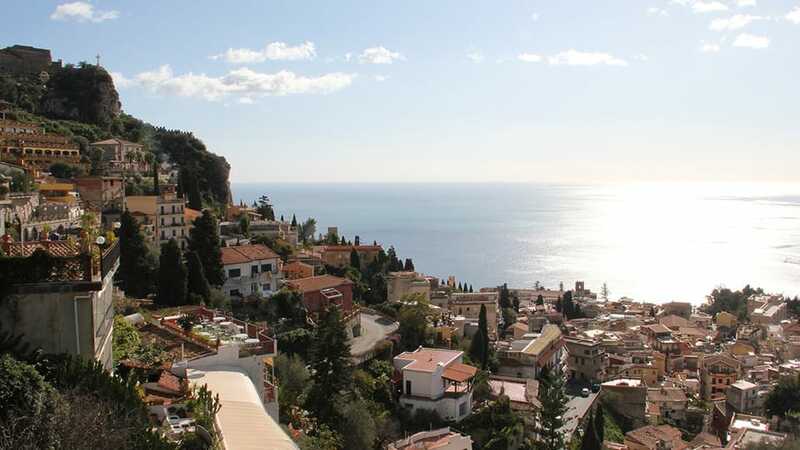 Among the many things to do in Taormina, this is a must-see, mainly due to the terrace with a view over the Ionian sea that you can enjoy from there. Above all the tours, at Excursions Sicily we also offer special VIP services. These are specially designed to meet your needs and requirements. 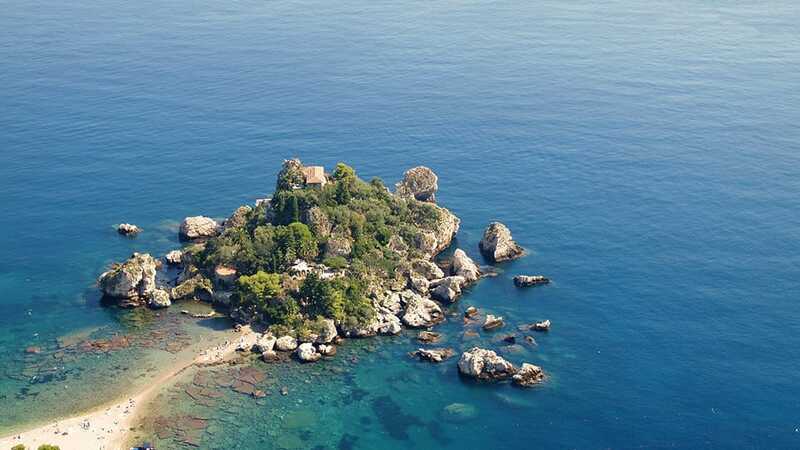 So this will be the perfect situation to discover the best 10 things to do in Taormina. What are you waiting for? Book the best private transfers from any Airport, Port or Train Station in the Island! We’ll be more than happy of hearing from you!